Welcome to the Pediatrics Plus Research page. As we grow and develop our research department, we hope to bring to you the exciting new findings that support what we are currently doing as well as those that may prompt us to change and move toward a different, evidence based approach as we serve your child and your family. This page will highlight our completed and upcoming projects as we collaborate with various universities and other researchers. Additionally, our company provides consistent communication to area physicians highlighting specific practices, issues, and trending topics in pediatric therapy. We would like to share those with you here as well. If you have any questions regarding research here at Pediatrics Plus, please contact our Research and Professional Relations Coordinator. Acclaimed American novelist, Jack Kerouac, once said, “Great things are not accomplished by those who yield to trends and fads and popular opinion.” Though he was not speaking about scientific research or fields of practice, the adage is still quite applicable and can inspire therapists to act based on more than opinion, trend, or fads in the health care system. Pediatrics Plus constantly strives to do more than go with the flow resisting the urge to base our practice on opinion or what is popular at the time. On what should we base our actions as therapists? The evidence! Sackett et al defined evidence based practice (EBP) as an “integration of the best research evidence with clinical expertise and patient values.”1 The American Physical Therapy Association also includes the terms “open and thoughtful clinical decision making about the physical therapy management of a patient” referring to the therapist’s (occupational, physical, or speech therapist) ability to easily dissect and communicate the process by which the clinical decision was made. The therapist can also appropriately weigh the risks and benefits in a professional context while integrating the three previously mentioned elements of evidence base therapy (EBP): 1) best available evidence, 2) clinical judgment and expertise, and 3) the preferences and values of the individual patient/client. Why is EBP so important? Jewell, author of Guide to Evidence Based Physical Therapy Practice, states that many occurrences have converged together to motivate the need for evidence based practice in all of health care including: documented unexplained practice variation, publicity surrounding medical errors, potential or actual harm from previously approved treatments, advances in technology, and rapid dissemination of research through the Internet.2 Largely based on this combination of reasons, third party payers and government programs are demanding the use of treatments that are evidence based. It is our responsibility as a profession to properly research the interventions, diagnostic tests, and outcome measures we use to determine their effectiveness rather than relying on a system based upon “the way it has always been done.” As you can see, among other things, evidence based practice is very important for the health and safety of the children we see as well as to secure appropriate reimbursement for effective treatments. Pediatrics Plus aims to meet the challenge of serving children and families across the state equipped with best practice as demonstrated in the research. Where research is limited or has not been produced, we hope to begin filling that gap with exciting and useful research projects that will provide therapists with the evidence necessary to guide strong clinical decision making in order to help children and their families do “great things”. Sackett DL, Rosenburg WM, Gray JA, Haynes RB, Richardson WS. Evidence based medicine: what it is and what it isn’t. British Medical Journal. 1996;312(7023):71-72. Jewell DV. Guide to Evidence-Based Physical Therapy Practice. Jones and Bartlett Learning; Burlington, MA :2010. Pediatrics Plus has recently obtained Institutional Review Board approval through the University of Central Arkansas to move forward with a study investigating the effects of a collaborative intervention approach for preschool children with autism spectrum disorder. This study will utilize a prospective cohort design to explore an innovative collaborative intervention approach implemented in our clinics and preschools. Additionally, we will explore outcomes for preschool children with autism spectrum disorder who have received outpatient therapy services or specialized classroom education through a retrospective review. The data generated through this study will help us better understand the benefits children may receive and how they generalize to everyday function and life. Blankenship C, Lowe L. Body weight support treadmill training (BWSTT) for a non-ambulatory child with cerebral palsy who is blind. Arkansas Physical Therapy Association oPTimize 2017: Fayetteville, AR; October 2017. 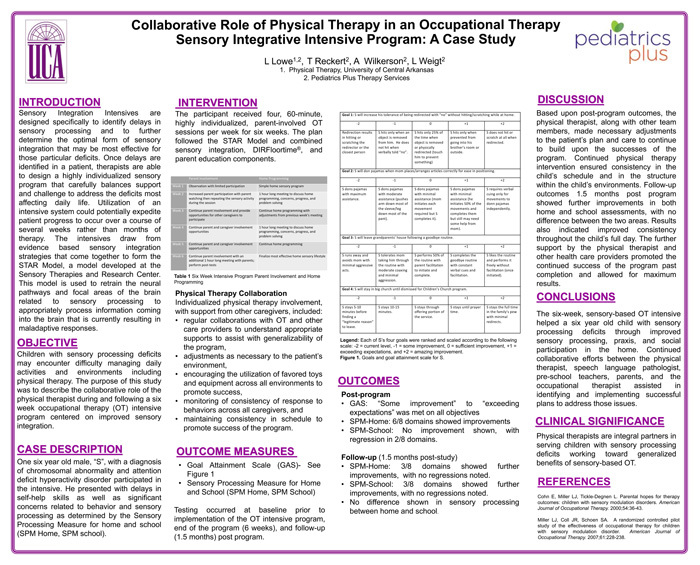 Lowe L, Reckert T, Wilkerson A, Weigt L. Collaborative role of physical therapy in an occupational therapy sensory integrative intensive program: a case study. American Physical Therapy Association Combined Sections Meeting: Anaheim, CA; February 2016. Lowe L, Montgomery A, Choate J, Spinelli A. 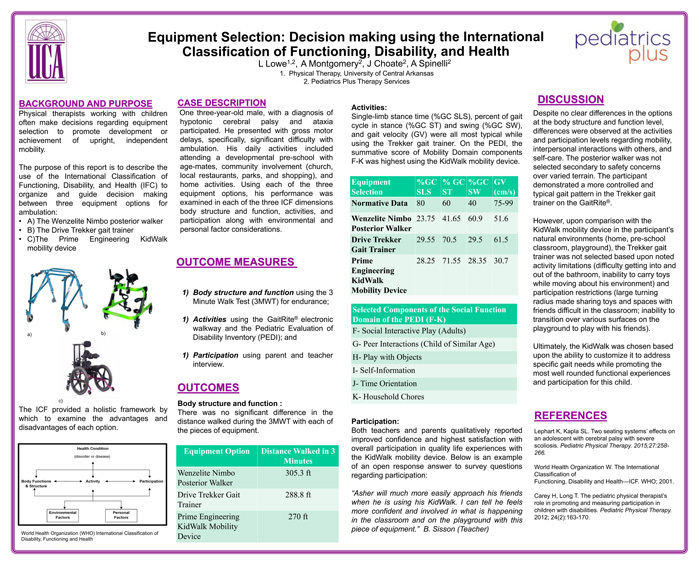 Equipment selection: decision making using the International Classification of Functioning, Disability, and Health. Arkansas physical therapy association oPTimize 2016: Little Rock, AR; September 2016. **Often, prior to completing a full, large scale study, it is essential to test the intervention or protocol on a smaller sample size in order to determine if a larger study is feasible and any necessary steps to allow a larger study to function more smoothly. 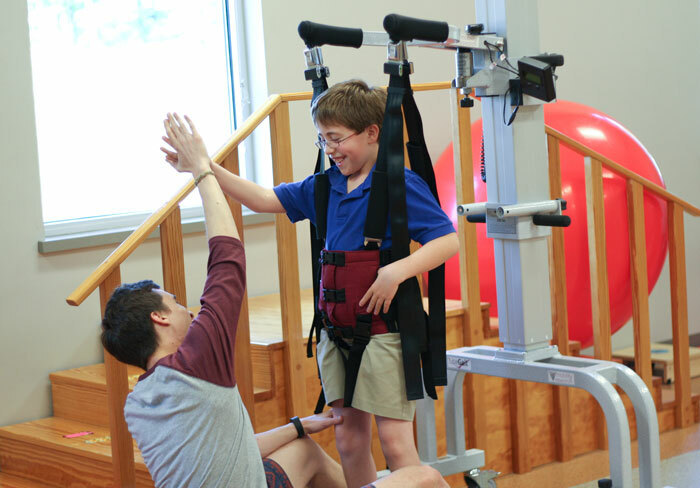 The results of this pilot study suggest that BWSTT is a safe, time –efficient, and clinically practical intervention for improving gait speed and higher level gross motor skills for children with DD. These finding were presented at the 2014 APTA Combined Sections Meeting in Las Vegas, NV. 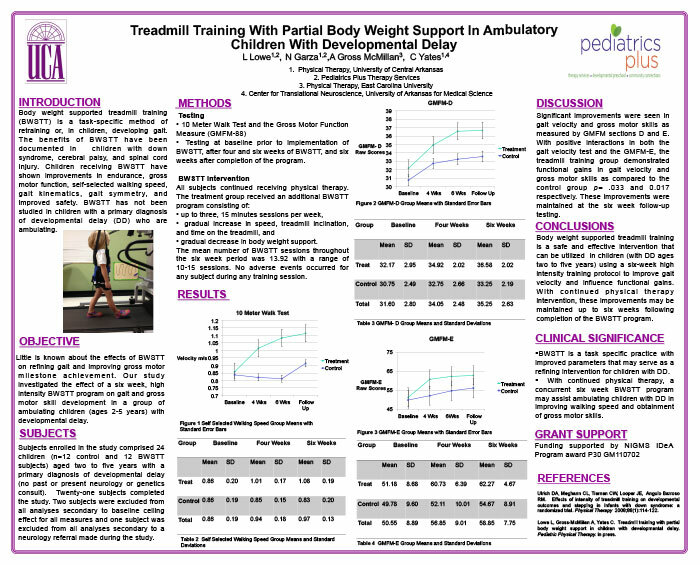 Body weight supported treadmill training is a safe and effective intervention that can be utilized in children (with DD ages two to five years) using a six-week high intensity training protocol to improve gait velocity and influence functional gains. With continued physical therapy intervention, these improvements may be maintained up to six weeks following completion of the BWSTT program. These findings were presented at the 2015 APTA Combined Sections Meeting in Indianapolis, IN. Additionally, the full report from this study is in press and will be published in Pediatric Physical Therapy.